We have three different size snakes for cleaning drains, depending on the diameter of the pipe. Typically a small 1” to 2” line would serve fixtures such as kitchen sinks, bathroom sinks, bathtubs, laundry tubs, floor drains. Think of the plumbing in your house as a road map. Each individual fixture would represent a side street. Your side streets all hook into intermediate boulevards (think 2” to 3” pipes) which then feed into main streets (toilet lines) which then run out of your house to the municipal line in the road in the form of a four inch or larger pipe. The process used is pretty much the same for any size pipe, the only difference being sizing the correct size snake to the size of the pipe. 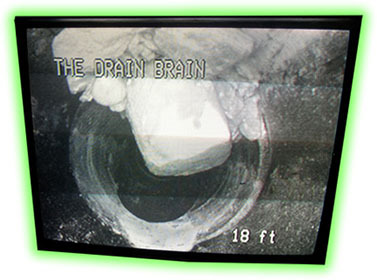 Entry to the pipe is typically gained either by disconnecting and removing a section of pipe beneath the fixture called the p-trap, or by removing a cap or plug from a cleanout fitting. The snake is inserted into the pipe and rotated as it is advanced through the pipe, cleaning and sweeping the interior walls of the pipe for such a distance as to clear the clog. The snake is then withdrawn, the piping reassembled, and the fixture tested. Sometimes snaking is not successful at clearing a clogged pipe. This can happen when there is a sag or belly in the pipe. In this case there is always water trapped in the belly that can’t get out. As a result anything coming down the pipe hits that water and stops. Then the next stuff that comes down the pipe hits into that and stops. And so on, and so on over a period of time. Eventually over a long period of time instead of one solid clog forming in a short length of space, a very thick oatmeal like substance forms over several feet in the pipe. We affectionately call this substance sludge. It will allow the snake to worm its way through back and forth through the sludge, but it can’t force it to move. So in this case we “jet” or clean the pipe essentially with very high pressure water. There is a nozzle at the end of a hose that is fed into the pipe until it passes through and beyond the sludge. This nozzle has multiple ports that stream high pressure water that will disintegrate and dissolve the sludge. As the hose is slowly withdrawn it dissolves the sludge and cleans the pipe. We are able to find and locate pipe and underground structures, such as septic tanks, utilizing transmitters and hand held locating equipment. We require an opening through which a transmitter can be inserted, such as a cleanout fitting or even an open pipe, and we then push the transmitter to the desired location. Many times this is coupled with the camera and video inspection. Once at the spot requiring locating, we activate the hand held locator and find the transmitter. The signal emitted by the transmitter is specific to the system and is not affected by any other electrical device. This service is very useful in finding out where the pipe or structure is before wasting a lot of time and money digging where it is not! It is also extremely accurate and also provides a depth below surface. Video inspection of pipes answers the questions that may arise. 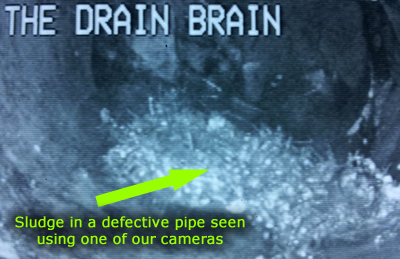 Typically we do not inspect pipes just because they clogged up once. It’s not necessary. However, if a pipe is repeatedly clogging, or if we have great difficulty in getting it to unclog, there may be indicators that would make an inspection make sense. In these cases we have two camera systems available that would cover just about any pipe in a typical residence or commercial building. These cameras are connected to monitors and pushed via a fiberglass cable through the pipe. Lighting, contrast and brightness are all controllable and the detail is remarkable. We also have transmitters so that when a problem area is identified we can find the location as well as note the depth below the surface. Additionally, we have the capability to inspect much larger pipe, up to several feet in diameter, using remote control crawler type camera equipment. This equipment is state of the art, very complex and affords detailed inspection of areas otherwise inaccessible. All inspections can be recorded to a disc if required. Recordings are normally requested by commercial or industrial accounts, contractors, architects, etc. 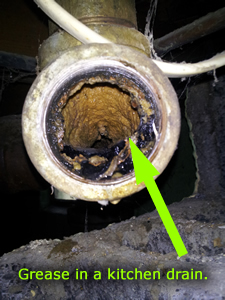 for additional documentation of a pipe's condition for one of many reasons.